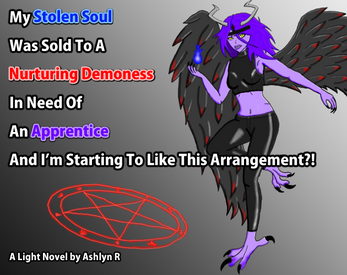 My Stolen Soul Was Sold To A Nurturing Demoness In Need Of An Apprentice And I’m Starting To Like This Arrangement?! "My Stolen Soul Was Sold To A Nurturing Demoness In Need Of An Apprentice And I’m Starting To Like This Arrangement?!" A down on their luck protagonist, constantly beset by misfortune, finds themselves abducted, summoned into a dimension that is a mirror of hell by a demoness looking for an apprentice. This a story about healing, new beginnings, finding and forming chosen family, transition and choices. Another light novel set in my narrative universe of Magic, Witches, Gods, Demons, Dragons, Superheros, Supervillains and infinite connected dimensions. Preview for #Lightnovelber2018 is 2 chapters, full story will be 6-8 chapters and released late December or early January. These chapters may be subject to further changes or edits in final release. Full story released! 8 Chapters + Epilogue, approx 12.7k words. Changes have been made to the chapters that appeared in the preview. Content note/warning: Depictions of gender dysphoria, implied parental abuse, neglect, brief mentions of past conversion therapy, resulting homelessness and related trauma, obscenities. Demoness' Apprentice is finished and launched!